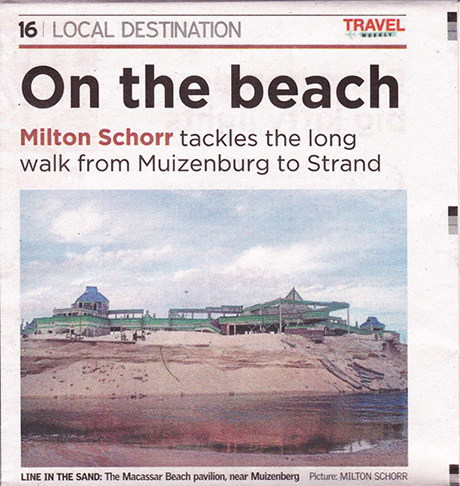 Muizenburg is famous for its long, unbroken beach. I’ve often stood on it, following its run with my eye, and wondered if it’s possible to walk all the way along it to the Strand, just visible across False Bay. Over time I’ve asked a few people if they know, and none have been sure. Some think there are cliffs out there that would make it impossible, others speak of some kind of no-go military base, all agree that it’s too far to walk in a day and because of muggings and murders, too dangerous too. I couldn’t stop wondering though, and so one day, armed with a pack for a possible night in the open, I decided to find out. I started walking at around 10:30 in the morning. The first thing I noticed was the limitlessness of it all. White sand stretched away, a solid river into the distance. Above that the sky was huge, partly cloudy with high, swept wisps in large and small pieces. The temperature was pleasant and to my right the sea lapped warmly. Groups of people caught my attention. Three fisherman up to their wastes in water vacuuming the sand with hand pumps for live bait, groups of children in the shallows, lying flat as the warm waves flowed over them, a solitary walker like myself but a woman of fifty-five or sixty, browned and lean. I took pictures, bending to the breathing hole of a prawn, or a jelly-fish, or a helicopter against the sky. I noticed that there were anglers, a steady stream of them in ones and two’s. I stopped and spoke to one of them, discovering that there was a competition on that day, and that shark was the main quarry. I thought on sharks as I walked, musing that they were a fitting metaphor for the journey, wild and unknown, yet within easy reach. After roughly two hours I hit my first milestone. I didn’t know it then but this was Strandfontein Pavillion, the first of three old-time resort setups, each stranger and more remote than the next. The facilities there seemed forlorn, broken, the people on the other hand happy and at home. I kept going. At this point the coastal road that had until now been running parallel with the beach veered off, causing a new solitude. After some time I noticed this, and turned around. Muizenburg was gone. Her red and white roof, her flags and crowds disappeared in the haze. Everything now was stark and blended, natural and tough. I saw a wedding party taking pictures on top of a sand dune, at my feet a dead puffer fish, then a seal pup. Time telescoped, white sand merged with pale sky and distant mountain, wave with wave and step with step. After 14 km’s I reached Strandfontein Coastal Resort, a new playground materialising out of nothing. Here were crowds, generations of families lounging in the sun and blowing sand. I didn’t stop. By that time my left leg was hurting, a dull throbbing behind the knee. One kilometre later I discovered that those I had spoken to were right. There were cliffs, crumbly white limestone boiling straight up out of the beach. I struck out left through the bush, intent on the road and rejoining the beach as soon as possible. This was the beginning of Wolfgat Reserve, a 248 hectare area encompassing the cliffs. I decided to rest and eat. My feet were red and swollen, the cool air on them perfect. I looked out to the Strand. She was bigger, much bigger. For the first time I thought that I might be closer to the end than the beginning, that it would be better to keep going than turn back. I carried on, stiffly now, my left leg getting worse. A kilometre later I reached Monwabisi Beach. Here there was a huge tidal pool with a wooden jetty pushing out into it ringed by nearly a kilometre of empty facilities, empty braai’s and paths, awnings, even an amphitheatre, all bare, dry and forgotten. I carried on. Clouds pulled in and the wind went cold. I wondered if it would rain. Underfoot was rocky, my leg jarring. I was tired, picking landmarks ahead as goals, promising myself a rest and drink of water when I got there and when I did, pushing on. I came upon the carcass of a large shark, four or five foot. It lay alone on the beach, its tail, dorsal fins and head sliced off. It was sad and ugly, the open cuts a different kind of wildness. I kept on, talking to my throbbing leg out loud, urging myself. Later, around 28 km’s from Muizenburg, I saw a group of anglers ahead of me, say seven of them. They were dressed in wetsuits and shorts and hats, some with shades. One of them was leaning hard against his rod and line, his back turned to the ocean. His mates were stalking the shallows and looking out, pointing, stalking some more, then looking back at the leaner. Two of them were carrying long, bamboo-poled gaffs. The leaner suddenly turned and worked his rod, up and down up and down then walked up the beach fast, his line hard in the water. I broke into a swinging hobble, not wanting to miss it. One of the gaff-wielders waded out, pointing. There was something big kicking in the surf. Full of concentration he stood, then reached out his long hook and struck, jerking and kicking, running with short steps backwards up the beach. To my astonishment he was dragging a large shark, around six feet. I was stunned. She lay long and wet on the sand. The men crowded round, stroking her, drinking her in. The leaner was ecstatic as he grabbed her by the nose, pulling her mouth open, exposing her rows of teeth before removing his hook. She was sleek and beautiful. A golden, feline eye looking out at the bipeds surrounding her, seeming almost sheepish. They took photo’s and a measurement and then the leaner dragged her back to the water. We all watched as she kicked her tail and disappeared into the waves. I turned to see the men leaving too, all quiet and business as they packed their things till finally their last bakkie rocked over the last dune. I dropped my bag and sat down, tired. In front of me the sun was setting, the sea was wet and cold, fathomless. I thought on the shark, her eye, the way she lay and took their attentions with good humor. She had a personality. She had a face, she had been vulnerable. I thought on this journey, this one day getaway, and felt then like I’d achieved something. I knew that beach like I knew that shark. I looked left to the Strand. There she was, just round the last curve of the bay, right there. I knew that I’d made it, all I had to do was walk. I limped into the Strand at 9h30 that evening. The walk was around 35 km’s in total. I discovered that there are cliffs that you’ll need to walk around, that there is a military base (a munitions factory), but the fences are broken and the surveillace cameras don’t work. I found that it was dangerous, it is a dangerous place, but personally I encountered none of it. I slept that night in the Strand’s dunes, watching the stars, knowing that it was possible to walk all the way, along the long beach, from Muizenburg to the Strand.